Fred Fox is Councilman and Representative from White Shield East Segment. As a councilman, he is Chairman of the Judicial Committee/Human Resources and a member of tribes’ Natural Resources; Economic Development; and Education Committees. In 2012, Fox was elected to his position as White Shield Representative with a majority vote, one of only a few Tribal candidates won their election by a majority vote. In 2016, Fox was elected without opposition. Fred has worked with the tribe for 18 years. 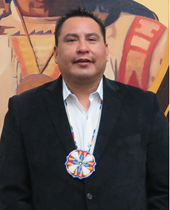 His work experience includes administrator of the Three Affiliated Tribes Energy Department; administrator for National Resources and Director of Water Resources for the Tribe. Currently, he oversees programs in the White Shield Segments. Fox serves his 3rd term of six years as White Shield School board president. He serves on the Board of Directors of the Thunder Butte Refinery; MHA Systems; Justice Commission and White Shield School Board of Directors. He is a member of the Young Hawk/Bear Legion Post 253 and is Whistle Carrier. Fox is a member/Whip Carrier of Dead Grass and Old Scouts Society. Fox is a veteran and served in the United States Navy and was stationed on the USS Nimitz & USS Clifton Sprague for four years. He has an Associate in Science and Liberal Arts, Ft. Berthold Community College, 1999; Bachelor’s Degree, Minot State University, 2003; and Master’s Degree in Management, University of Mary, 2006.